The bounty of Chesapeake Bay seafood isn’t just delicious — it’s also an economic driver. The estuary’s crabs, oysters, and fish are at the heart of Maryland’s seafood-processing industry. Each year, this sector contributes several hundred million dollars to Maryland’s economy. But our seafood industry has also changed significantly since the turn of the century when watermen pulled oysters out of the Bay by the boatload. In the 1980s, roughly 50 crab processing businesses operated out of the state. By the 2000s, nearly half of those businesses had closed, due in part to a rise in imported crabmeat. Competing against the flood of imported seafood coming in from overseas. Using modern methods and sanitation to keep seafood safe to eat without compromising taste. Adding economic value to Maryland seafood products, giving consumers more for their money, and garnering better profits for local businesses. Maryland Sea Grant Extension’s specialist works with Maryland’s seafood processors and other businesses to help them confront those challenges. Many still process crabmeat, oysters, and other Bay delicacies like they’ve done for decades. But new technologies can also help to keep these traditional businesses competitive in a global marketplace. 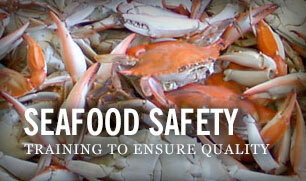 Seafood safety: Sharing resources on food safety training and decreasing bacterial contamination in Maryland seafood. Seafood technology: Developing new tools to improve the efficiency of seafood processing and new ways to market Maryland products.